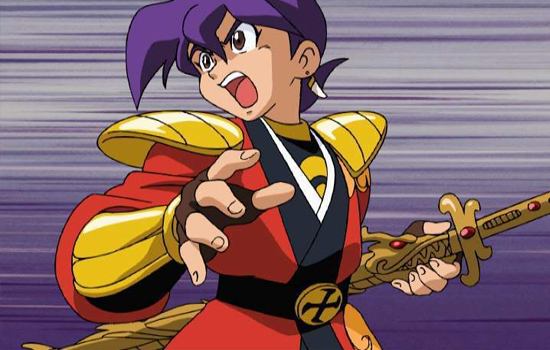 The sword and scabbard of Sengoku Manjimaru are featured in the Tengai Makyou II video game, which is set in a beautiful country named Jipang where the Fire clan and Roots clan have been rivals over centuries since the dawn of time, good versus evil. I was commissioned to make the sword and scabbard from this video game. I started by cutting the blade halves from 1/4″ poplar, cutting a channel inside each for a steel support rod and glueing the wood together. 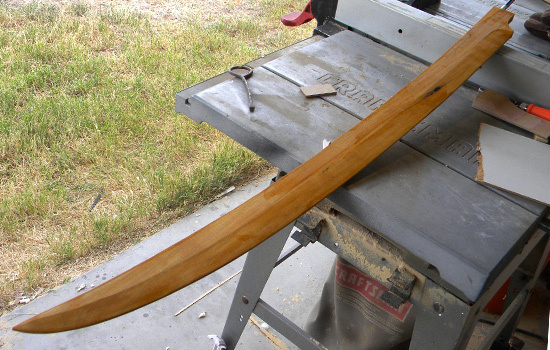 I sanded an edge on the blade then sealed the wood with shellac. I made the blade collar from black styrene plastic. 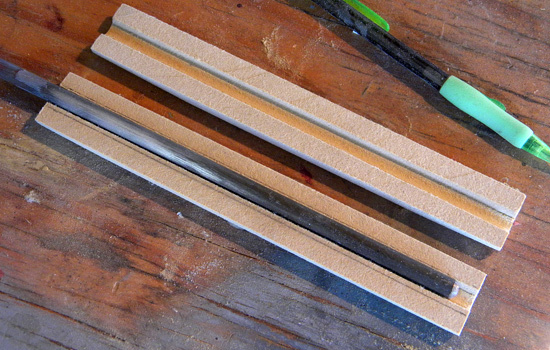 I cut hilt halves from 3/4″ MDF, cutting a channel for the steel support rod and blade collar. By the client’s request, I painted the blade red. I shaped the hilt using a Dremel sander. 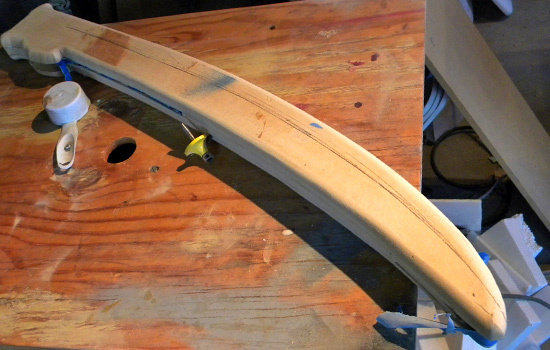 I lined the scabbard with soft cloth to protect the finish on the blade. I glued the scabbard closed and rounded the edges on the router table. I carved some belly scales into the scabbard using chisels and utility knives. I cut channels for the steel support rod in MDF grip halves. 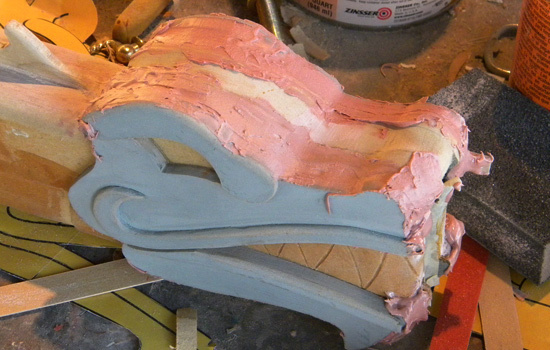 I glued the grip parts together and carved out areas for the scale insets and gems. 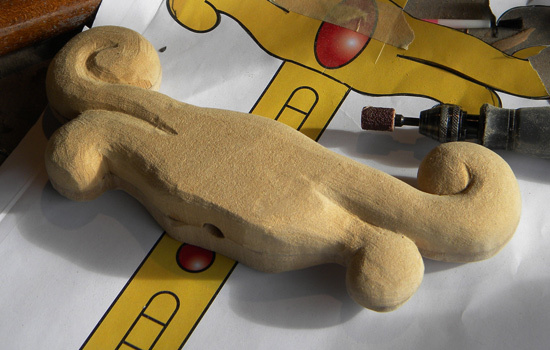 I cut parts for the face out of 1/4″ and 1/8″ MDF. The face parts glued on. I cut eyes from 1/4″ red acrylic that fit into the eye socket. I puttied up the gaps between the face parts and the scabbard. 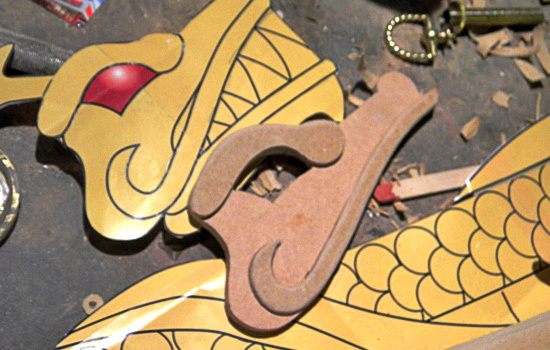 I glued on 1/4″ antlers to the dragon’s head. I made stamps for scales out of hardboard and dowels. 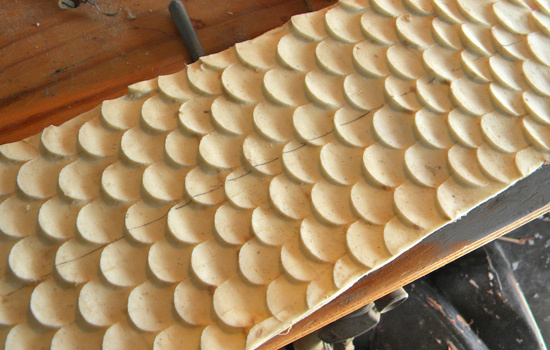 I rolled out a long sheet of clay and stamped scales into the surface. I poured plastic resin into the mold and removed a sheet of scales! 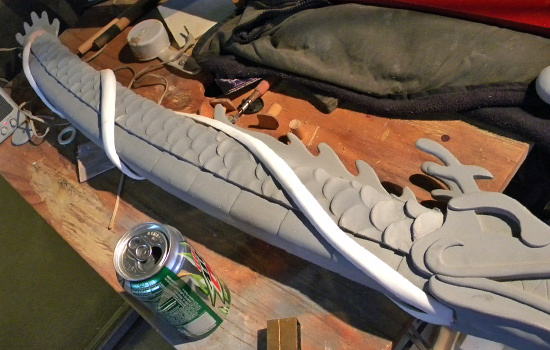 I used a heat gun to soften the scale sheet to it would wrap around the dragon’s body. I used the same technique to cast resin whiskers. I used a heat gun to soften each whisker and wrapped it around the body. 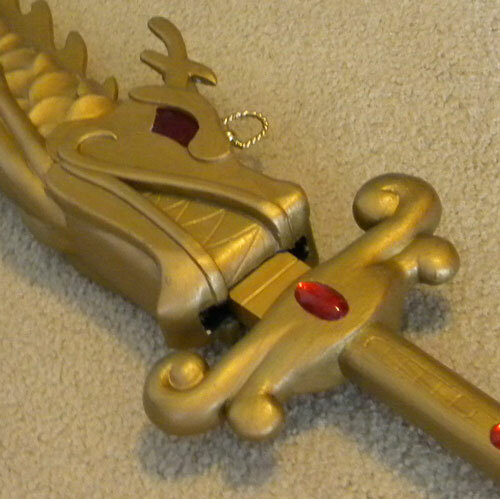 I painted the scabbard with brass paint. I attached rings to the dragon’s back so it could be worn. I cast red resin gems for the pommel and grip. The final sword and scabbard! The sword in the scabbard.